PHAI has been on the forefront of the movement toward health smoke-free homes since we were the first to publish an article on the theories to achieve this goal way back in the year 2000. Children, in particular, are likely to be exposed to tobacco smoke in multi-unit housing even if nobody in their household smokes in the home. 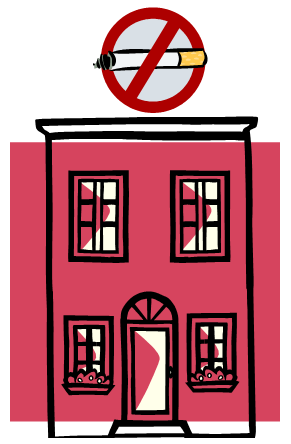 Since then, we have worked closely with the Massachusetts Department of Public Health to provide support to tenants, landlords, and condominium owners and associations to understand the benefits and challenges of making homes 100% smoke-free. PHAI Attorney Chris Banthin Appears on WGBH with Boston Mayor Tom Menino to Discuss Smokefree Public Housing. 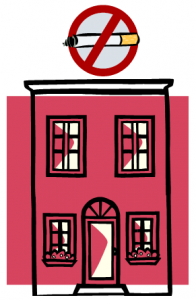 A smoke-free rule makes sense to both residents and property owners. Exposure to secondhand smoke, a Class A carcinogen, can result in illness and even death. Secondhand smoke is rarely contained inside an apartment or condominium unit. It flows into neighboring condominium units or apartments and then stays in the air for hours, exposing nonsmokers and their families for long periods of time. For landlords and condominiums, secondhand smoke can damage and devalue property. Smoke-free buildings have been shown to increase resident demand for units, cut maintenance costs, and lessen liability. Make your building smoke-free and join the growing number of landlords and condominiums who are reaping the benefits of a smoke-free rule.